Is this the earliest record of an operational Military Reaction Force (MRF)? 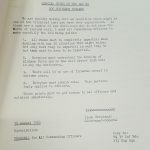 A British Army 39 Brigade Commander’s Diary from October 1971 could have uncovered the earliest operational record of the clandestine Military Reaction Force. We have other records naming the main players like Captain Arthur Watchus and Sergeant Clive Graham Williams from the beginning of Internment in August 1971 but none naming MRF on active duty. 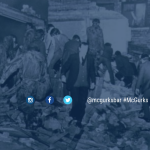 We had previously uncovered a discussion of the MRF by none other than Brigadier Frank Kitson dated 4th December 1971 – the day of the McGurk’s Bar Massacre. You can read about that in The MRF and its Director of Terrorism over on the McGurk’s Bar website from June 2014. These records are from the British army’s Brigade operations log from 22 October 1971. The 1st Battalion Green Howards (1GH) reported to 39 Brigade that the regiment was “Worried about PARA Coy op in our area. Bus op”. The Green Howards were stationed in Ardoyne and concerned about a Parachute Regiment Company operation and/or observation post no doubt at Ardoyne Bus Depot. Brigade’s action was “OC MRF told to brief 1 GH thoroughly”. The Officer Commanding of the MRF at this time was Captain Arthur Watchus who we unmasked in 2011. The MRF was developed around a nucleus of SAS and Para soldiers and housed with 1 Para at Palace Barracks which is why it is referred to as a PARA Company here. It is unclear whether the unit was operating in its reconnaissance or reaction role from the archive (reconnaissance to gather information and reaction for armed contact). There could be a number of reasons why the Green Howards were worried about an MRF operation in its zone of control. 1GH may have been concerned that its soldiers would mistake non-uniformed MRF operatives for IRA or have accidentally crossed paths with the potential for blue-on-blue fire; or 1GH may have been concerned with MRF tactics disrupting its own battle for the hearts and minds of Ardoyne’s population. Otherwise, its leaders may have been miffed that a Special Force was operating on its turf as if it could not control its own area. As it happened the Green Howards had a particularly difficult time in Ardoyne and caused untold hurt by its actions against the civilian population. A log from the same file but dated 23rd October 1971 shows a report by the 2nd Battalion of Royal Regiment of Fusiliers (2RRF) that had stopped a “Q-car Grey Ford Transit Van. 6 men in it”. A Q-car was a British military vehicle disguised as a civilian vehicle. In this instant, Brigade report “Not MRF. 2RRF told”. 2RRF was stationed at Glenravel and oversaw the areas of New Lodge and Unity Flats. So, a few weeks before McGurk’s Bar Massacre (when 2RRF soldiers helped save survivors from the wreckage), we learn that MRF units are indeed operating in North Belfast. Nevertheless, the police’s Historical Enquiries Team and the Office of the Police Ombudsman informed this writer and McGurk’s Bar Campaigners that there was no record of MRF in the area at this time. 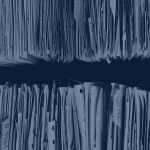 This file proves them wrong. Interestingly too, the files also show active observation posts and intelligence-gathering by the police and 2RRF around McGurk’s Bar. The Gem Bar or Hannigan’s was the original target of the bombers who then decided to leave their bomb at McGurk’s at the next corner, killing 15 civilians including 2 children.